Died on Monday, April 17, 2000, of Sterling, VA. He is survived by two sons, four daughters and eight grandchildren. He was a graduate of West Point Military Academy, Class of 1929, and a 1941 graduate of the University of Virginia Law School. 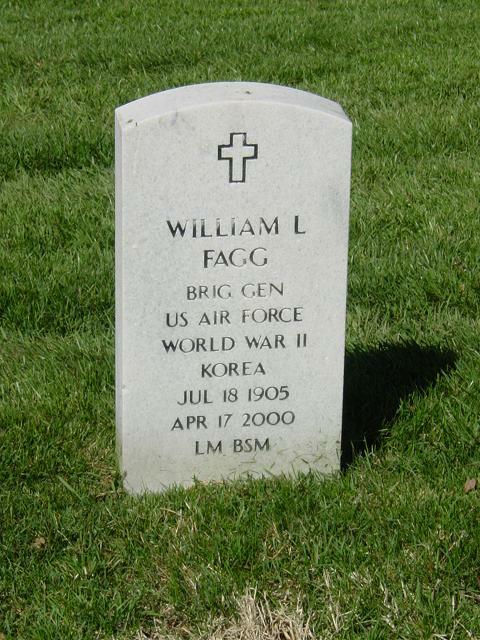 General Fagg served 29 1/2 years with the Air Force and received the American Defense Service Medal, European-African-Middle Eastern Campaign Medal, World War II Victory Medal, Army of Occupation Medal (Germany), National Defense Service Medal, one Silver and one Bronze Oak-leaf Cluster, and the Bronze Star Medal. After a distinguished military career, General Fagg was the Director of the American Society of Industrial Security (ASIS). He also taught math at Langley and Loudoun High Schools and was an active member of St. James Episcopal Church in Leesburg. He will be remembered as a devoted father, a lover of nature, and a walking enthusiast. Funeral services with Full Military Honors will be held at Arlington National Cemetery on May 10, 2000 at 1 p.m. Memorial donations may be made to St. James Episcopal Church, 14 Cornwall St., NW, Leesburg, VA 20176. William Lafayette Fagg was born in Blanco, Oklahoma, in 1905. He graduated from Farmersville High School, Farmsville, Texas, in 1922; attended North Texas Agricultural College, Arlington, Texas, in 1924, was appointed to the U.S. Military Academy, where he graduated June 13, 1929, and commissioned a second lieutenant. Until September 1939 he was stationed at Brooks Field, Texas; Fort Sam Houston, Texas; Philippine Islands; and Fort Howard, Maryland, in various capacities. He then entered Infantry School at Fort Benning, Georgia, and in June 1936 was appointed an instructor there. After a year at Fort Snelling, Minnesota, General Fagg entered the fall session at the University of Virginia Law School, Charlettesville, Virginia, and graduated in June 1941. Immediately thereafter he was assigned to the judge advocate general's office in Washington, D.C. He attended the Command and General Staff School at Fort Leavenworth, Kan., for three months prior to becoming assistant judge advocate of the First Cavalry Division at Fort Bliss, Texas, in February 1942. In June of that year he was named judge advocate of the Second Infantry Division at Fort Sam Houston, and in November went to Camp Springs, Calif., as judge advocate of the Fourth Army Corps. commandant of the Ground Liaison School at Kessler Field, Mississippi, in October 1945. Detachment. In February 1947 he was named executive officer of the Intelligence Division at European Command headquarters. He transferred to the Department of the Air Force on Sept. 26, 1947. Still in Germany, General Fagg was appointed deputy inspector general in March 1949. Returning to the United States in August 1950 he entered the Industrial College of the Armed Forces, and graduated in June 1951. Assigned to Air Force Headquarters in July 19S1, he was named executive officer to the inspector general; in June 19S2 he was appointed deputy to the air provost marshal; and in August 1953 he was designated the air provost marshal in the Office of the Inspector General. He has been awarded the Bronze Star Medal. He was commissioned a second lieutenant June 13, 1929; promoted to first lieutenant (permanent) October 19, 1934; to captain (permanent) June 13, 1939; to major (temporary) October 10, 1941; to lieutenant colonel (temporary) July 17, 1942; to colonel (temporary) Nov. 4, 1944; to major (permanent) June 12, 1946; to colonel (permanent) April 2, 1948; to brigadier general (temporary) August 25, 1953.